Our first two projects were for a lovely Assisted Living company with locations in two different towns. We were hired to decorate the public areas in time for a special visit from Santa! Because the two facilities are run by the same company, we were able to use the pieces in their collection in whichever space they worked best. For the first location, we planned a gold, silver, and white winter wonderland theme for the entry and library spaces. For the entry we found a fabulous silver sleigh which we filled with beautifully wrapped packages and surrounded with lanterns of varying sizes – some existing pieces and one large new one. A few of the client’s snow-crusted pine boughs finishes the vignette. Using some of the client’s collection of snowflake ornaments, we fashioned a snowflake mobile to hang over this entry snow scene. 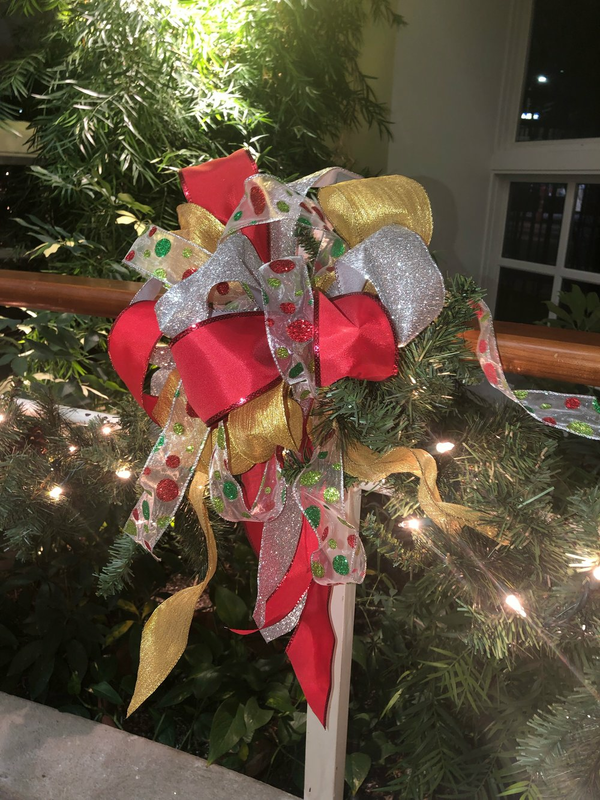 For the library, using much of the existing décor, we supplemented with some new white tree ornaments and sprigs, and yards of ribbon to create a beautiful, elegant Christmas tree. The fireplace mantel got new greenery and stockings to mix with the clients collection of gold and silver accessories , snowflakes, and candles. An existing wreath was rehabbed with some additional greenery, snowflakes and a beautiful new bow to coordinate with the tree. 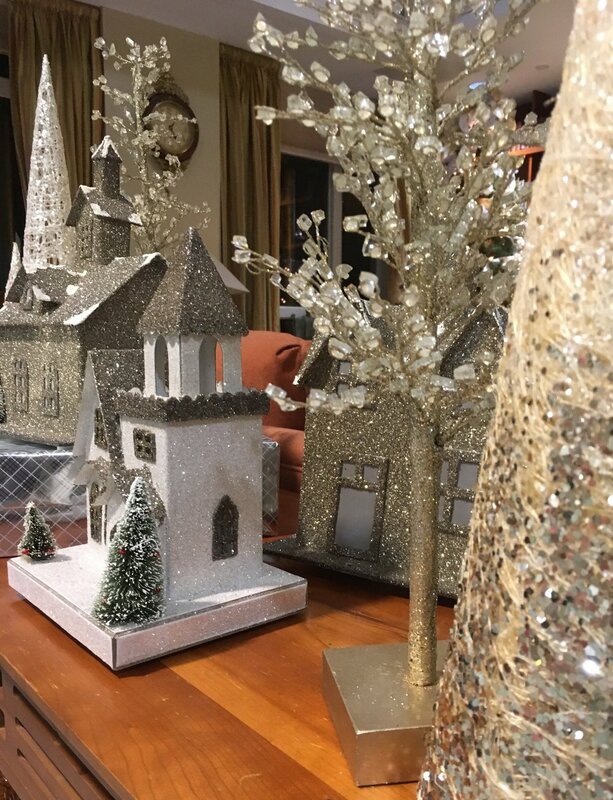 A winter village snow scene tops the console table behind the sofa – this was created entirely from the clients collection of gold, silver, and white houses, trees, and accessories. 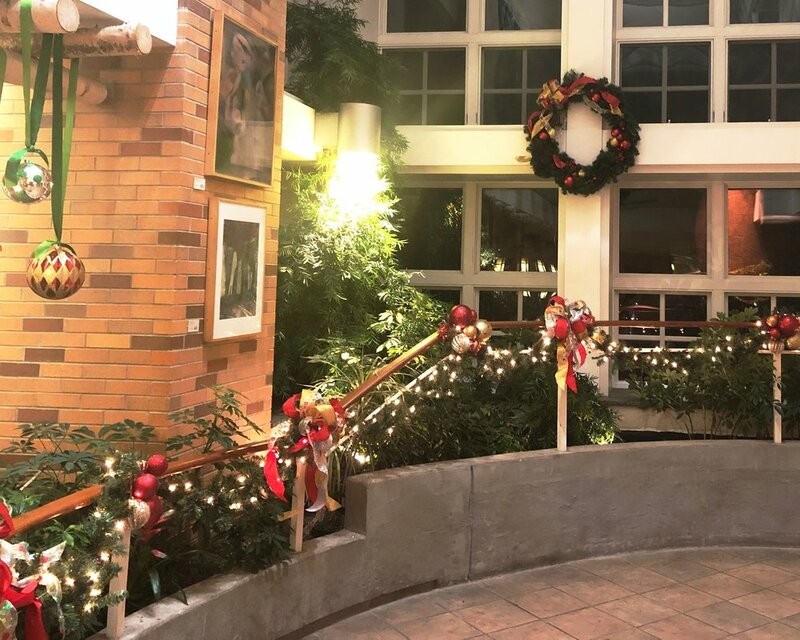 For the towering atrium garden room, we planned a very traditional and bright red, green and gold scheme using the garland, wreath, and assorted ornaments the client already had and adding lights ribbon and select new oversized ornaments and reindeer. We festooned the railings surrounding the space with lighted garlands topped with alternating clusters of ornaments and lavish bows. A second wreath decorated to coordinate with the garland hangs between the windows. Oversize ornaments and flying glitter reindeer are hung from an overhead birch log pergola. For our second location, we were asked to keep to a very traditional color scheme. For this location we planned an entry table with a nutcracker “palace of sweets” theme. We used new large scale nutcrackers, mixed with the client’s exiting green and red and white conical trees along with greenery and ribbon and the client’s large apothecary jars filled with wrapped candies. The library and sitting room are both open to the entry foyer and so we continued the nutcracker and candy theme for the library mantel, Christmas tree, and wreaths. We also installed the client’s garland along the 3 story stair railing and added new coordinating bows. In the game room a wreath and greens embellished with ribbon and some additional greens from the client’s collection adorn the fireplace mantel. Gold deer and gold and white conical trees fill out this mantel scene. In addition to the spaces we decorated, at the client’s request, we also redecorated 7 existing wreaths for additional dining and living spaces, as well as one new large wreath. Our clients were THRILLED with the finished spaces, and there is nothing better than a really happy client! We’ll continue tomorrow with the before and after pictures of our Christmas decorating project at the beautiful Inn at English Meadows in Kennebunk, ME.